The Thule VeloCompact is a lightweight tow bar mounted bike carrier that easily attaches using its one handed tow bar coupling system. The patented coupling is suitable for all types of towbars, and needs no adjustment. 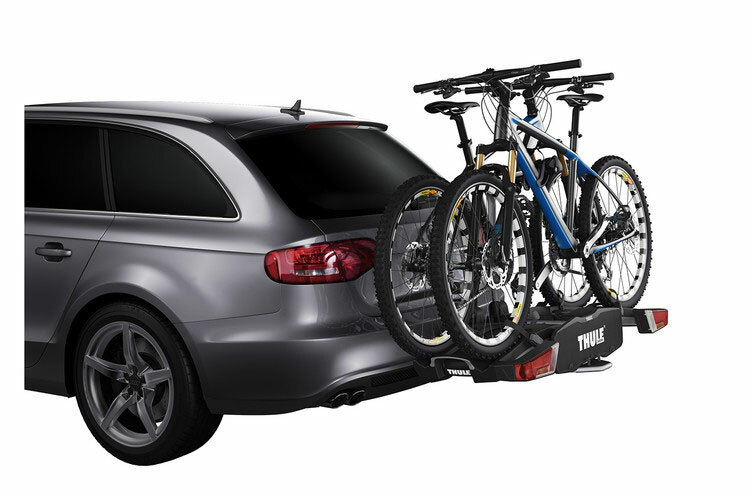 The Thule EasyFold 931 is a tow bar mounted cycle carrier that is able to fold up when not in use, perfect for storing in the garage or in the boot of your car. The Thule Xpress Pro 970 is the only tow bar mounted bike rack with an ISO approved tow bar coupling. The Thule HangOn 972 is the easiest way to carry three or four bikes. An easy-to-use, lockable tow ball mounted bike carrier, equipped with rubber frame holders protecting the bikes. The Snap-On coupling sits securely on your tow bar. The ultimate Thule tow bar mounted bike carrier for carrying upto 4 bikes. Easy to fit and simple to use. Includes a built in light and number plate board. Can be used with 4x4s with rear spare wheel.